celebrate with a view from the top. •The final Powderkeg event of the year. •Our private, 3rd-floor room with bar, banquet, and cocktail table seating. 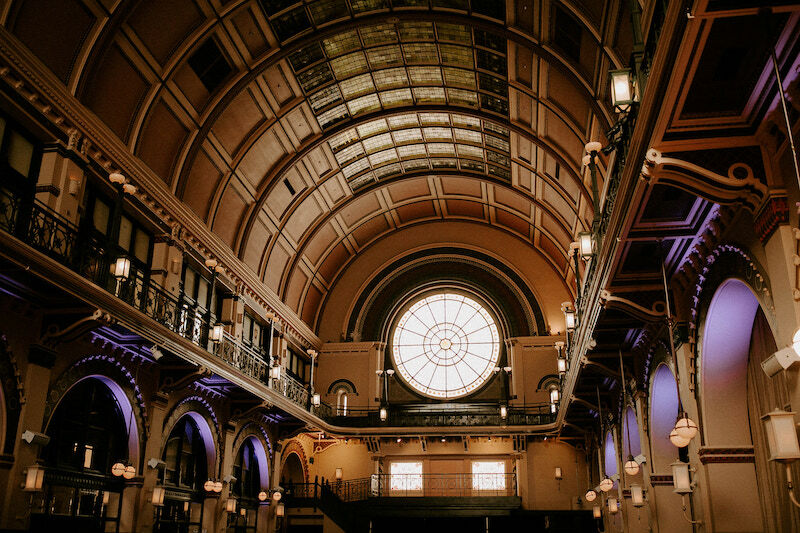 • A 3rd-floor balcony overlooking the gorgeous Grand Hall at Union Station, and the best view of what will be a 3 unforgettable countdowns at 10 PM, 11 PM, and Midnight. An authentic 1920’s speakeasy located underground, beneath the Grand Hall. Majestic 130-year-old ballroom for drinking, dancing, and an unforgettable countdown. Ballroom floating above Illinois street with a beautiful downtown view. The city’s most innovative DJ’s. A portion of all proceeds for The Indy Masquerade goes to support after school programs for at-risk youth in Indianapolis through Dream Alive. Masks are strongly encouraged, though not required to enter. But you absolutely should wear one! :) For context, about 90% of guests wear a mask for some portion of the evening. If you don't want to worry about it in advance, we'll have affordable masks available at the door. Yes - Evening Formal. Men - Jacket required. Dark suit or tuxedo recommended. No jeans. Women - Evening gown recommended, or spruce up your favorite cocktail dress. This is a formal event, and the perfect opportunity for you to dress your finest! Each General Admission ticket gets you 2 drink tickets, and there will be plenty of fun and creative ways to win more drink tickets (for free) throughout the evening. There will be passed hors d'oeuvres available throughout the evening, and the opportunity to purchase additional food. An All-Inclusive ticket will get you access to an additional private room with an open bar and premium hors d'oeuvres all night. Yes. Must be 21+ to enter. What are the best hotel options? As a guest of the Real Producers party and The Indy Masquerade, you’ll have exclusive access to discounted hotel rooms. Details will be emailed to you after you’ve purchased a ticket. Nope! The digital version automatically emailed to you will work just fine.